Terry Selwood, 73, was enjoying some quiet time on the water off Evans Head in northern New South Wales state when a giant white shark leapt onto his boat. Sydney, Australia: An elderly Australian fisherman has lived to tell the tale after a great white shark leapt into his boat, surviving with only an injured arm after he was sent flying by the thrashing beast. Terry Selwood, 73, was enjoying some quiet time on the water off Evans Head in northern New South Wales state when he was given the fright of his life. "I caught a blur of something coming over the boat ... and the pectoral fin of the shark hit me on the forearm and spun me round, knocked me down on the ground to my hands and knees," he told the Australian Broadcasting Corporation on Saturday. "He came right over the top of the motor and then dropped onto the floor." The shark was 2.7 metres (8.8 feet) in length and with the boat 1.4 metres across and 4.5 metres long, it was a tight squeeze. "There I was on all fours and he's looking at me and I'm looking at him and then he started to do the dance around and shake and I couldn't get out quick enough onto the gunwale," Selwood said, referring to the upper edge of the boat. "I looked down and I thought 'I'll be buggered there's a shark in me boat'. "I was losing a fair amount of blood, I was stunned, I couldn't register what happened and then I thought 'oh my God, I've got to get out of here'." He managed to grab his radio and called local marine rescue volunteers, who plucked him from the boat and took him ashore where he was treated for skin torn off his arm. 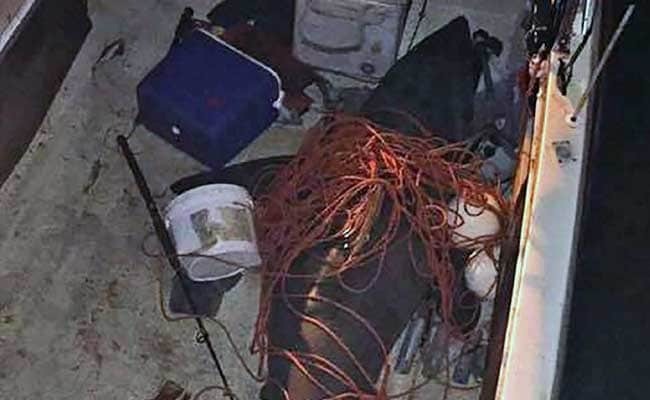 They returned to retrieve his boat and the body of the unwanted passenger, which a local department of primary industries official said was a great white. Selwood said he had been fishing for close to 60 years, but had never had been through anything like that. "I've had 'em come up and brush the side of my boat, I've had a white pointer swim around my boat, I've had 'em take fish off my line, but I've never had one do this," he told the broadcaster.